It’s amazing. 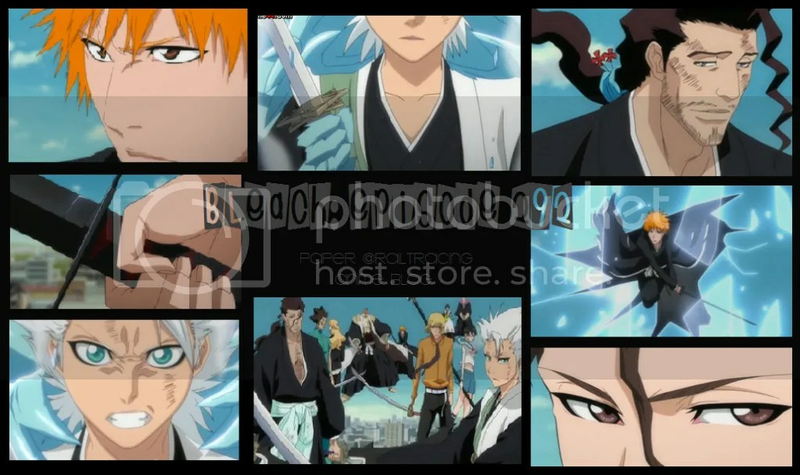 I believe that this is different from all the other openings of Bleach in terms of the animation of the Opening. It’s conveying this message or theme almost giving that sense of despair. It might be giving a hint of how Bleach may progress into depressing times for the protagonists. This Ending is alright. I like the first 18 seconds of it and then after that, it didn’t sound quite as good. It lost that good feeling that I had for it during the beginning. OH MY, finally things begin to progress and get interesting even if it’s at a snail’s pace. Aizen is getting Toshiro pissed off so bad.. Aizen’s probably provoking him on purpose with the intent of crushing Toshiro. He’s losing his cool way too quick but I guess he can’t be blamed since the most important person to him was hurt like that.. Even if they all went and attacked Aizen at once, I doubt they’d be able to harm him. He should go all out and he might have a chance to be on par with Aizen. With Unohana Captain there, I am at ease and not worried about Hyori dying. I’m wondering when the other characters [Chad, Rukia, Ishida, Orihime, Byakuya, ect.] will come and join the battle. They’ll probably be the ones to provide Ichigo support when he’s on the verge of losing. This entry was posted in Anime, Bleach, Currently Watching and tagged action, aizen, anime, Ichigo, kubo tite. Bookmark the permalink. aha i saw the new theme songs by chance and i agree opeining is amazing, and total plus coz its by sid XD, as for the ending it was just regular. anyway, lol that’s why sometimes i dislike the anime, coz they recap too much and hardly any action. yepp, the ending was average. I like the previous ending better. ahah, I like it better.. but that’s just me. lol, top 10 is short and concise. So, it probably won’t be much work, I think. ahah.